When you buy giveaway items from ePromos, we guaranteed that you’ll get the right item, the correct imprint, and timely delivery – or your order is free. We want you to be satisfied with your experience and completely happy with your final order, and we’ll do whatever it takes to make it happen. ePromos founded one of the first online promotional product websites in 1998 that serviced buyers of all sizes and provided a high level of customer service. Today, ePromos is one of the fastest growing distributors of giveaway items in the world and an eight-time winner of the Promotional Products Association International’s Web Award. 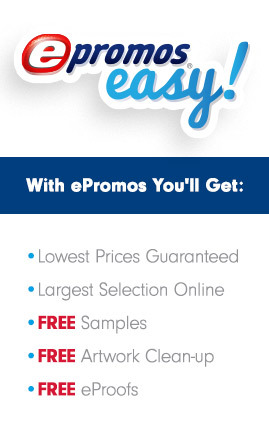 At ePromos, buying promotional giveaway items is a simple, quick, and comfortable process. With our easy to use website and large selection, it’s easy to find the right custom giveaway or gift for any businesses or organizations marketing campaigns or events. We have promotional items that fit any business and any budget. Your order will ship to arrive on time. ePromos is the best place to make promotional productss, corporate gifts, or custom event giveaways that will wow the recipients. Whether you’re a large company with a national marketing campaign, or a small nonprofit looking for custom products for an event, we can help you. Our friendly and knowledgeable Promotional Specialists are here to make your next project great!